Country Mouse Tales: Where Does the Time Go? Holy Poop! It's Friday? Are you sure?? I've spent most of the week in one of two places...curled up in bed, or kneeling over the toilet. And despite the fact that I hit the magical three month mark of this pregnancy this week, I am sad to say that I feel no better. I've been telling Matt that maybe, just maybe, I actually have come down with the much dreaded SWINE FLU. He kindly takes me by the shoulders, shakes me violently, and says "Bekah, shut up. You have morning sickness, deal." I guess I kind of expected some magical healing moment when I would suddenly look at the world around me and break into song. Birds would flock to me and land on my arms and I would suddenly begin to be able to carry a tune (which, in case you were wondering, no I still can't). I am sad to report there are no birds on my arms, no song in my heart...but there is nausea. Oh yes, there is nausea my friends. HOWEVER on the brighter, less vomity, side of things, I mentally am in a much better place. I feel much more secure about the health of the baby. Don't get me wrong, there are about a million things I am still worried about, but there is a new found sense of peace in my heart about the baby. 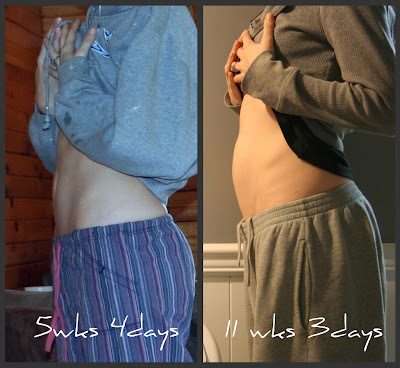 And just for fun...here is a belly picture comparison. And before someone jumps down my throat and says 'that's not a baby belly...it's too early to be the baby!" I know. Maybe you are right...but I'm still kind of amazed that there is any change at all. And yes, I know, you would never be able to tell just passing me on the street, but I CAN TELL. The thickening of the waist has begun!! (I never thought I would be happy to say that). 1. No I am not pushing it out. 2. I have actually lost three pounds between the first picture and the second picture. 3. I was painting that day...that is why my sweatshirt looks FILTHY in the first picture! Congrats girl! 3 months already? It flies by very fast. Hope the morning sickness ends soon! Congrats - and that sickness will go away ... or so they say. You look so much tanner in the second pic too! Bekah, congrats on the three month. And yes it seems to be flying by. Hopefully you will feel super fine very soon. Wow, I can't believe you're already 3 months along either!! I hope the sickness passes over soon. Yuck. Gosh you have great abs! Awwwwwwh. I love OTHER PEOPLE'S belly shots! And let me be the first to put my bid in. I think its a GIRL. Apparently Girls give the worst morning sickness spells. I hope this spell goes away soon though. Wow time is flying! Hope you feel better soon! Definitely a cute baby belly! Feel better soon! Hey you! That belly is teeny tiny and I love it! SOO cute! congratulations! Last thursday was a day of enlightenment for me.I found your blog in March through muddy boot dreams, and enjoyed it so much I added it to my favorites list. Every day when I check my sisters blog(muddy b d) I would check yours as well, but every day there was that poor little cactus, bent over the pot. I thought- oh well she must be very busy with her garden and fending off those neighbour chicks who flock to her husband. And then---last thursday, an epiphany! and I found all of your most recent updates. All the excitment in your life and a new baby also. Not only that, but my cat had kittens on that day also. It was fortuatous all around. 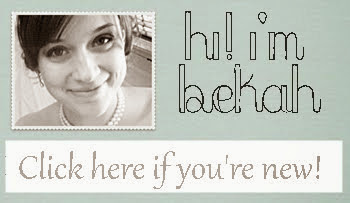 Now that I know how to view your blogs latest updates, I look forward to all your new happenings. PS yes you can see a difference in your belly. oh hi turf toter! I have read so much about you on your sisters blog! Thank you for your congrats! Congrats on the kittens! How cute! That is so a baby bump! So cute! 3 months already holy cow! !